When a Swiss and a German make a promise and shake on it, that promise is etched in stone – so they say. Half way through their three year acting degree at the Bern University of the Arts, Diego Brentano & Niklas Leifert decided to realize their first feature film. In August 2009 the story took shape and the production team fell in place. 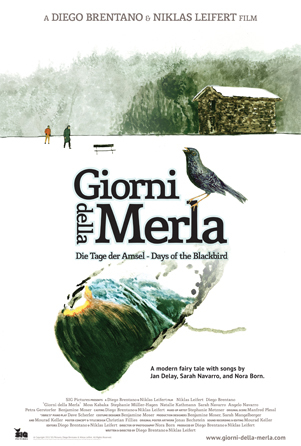 After 3 weeks of filming in Astano, Ticino, 5 days in Hamburg, and countless hours spent in the studio, they kick off their professional careers with the 2011 release of Giorni della Merla – Days of the Blackbird. The 75 minute low-budget feature film combines atmospheric images (director of photography: Nora Born) with strong musical elements (score by Manfred Plessl and songs of Jan Delay, Sarah Navarro, and others). Credit for writing the original screenplay, directing, producing, casting and editing, as well as portraying the two protagonists goes to Diego Brentano and Niklas Leifert. They had a crazy idea and the guts to bring it to life – without any professional filmmaking background they learnt the ropes as they went along. To support the release of this film – and others yet to come – they have founded SIG Pictures. The production house will not limit itself to any genre, but aims to combine entertainment and poetry in all its projects.